Listen past the din of construction and bustling nightlife in Downtown Miami, and you just might make out the sound of crying babies and backpack-toting teens. A new demographic study by the Miami DDA finds that the number of people living in Miami’s urban core has grown by nearly 40 percent since 2010, with children comprising one of the district’s fastest-growing age groups. What’s driving this generational shift? Chalk it up to a Downtown Baby Boom. During the recession, thousands of millennials poured into Downtown Miami in search of affordable rents. Once they got settled, they realized that Downtown life was chock full of everyday conveniences – from walkable streets and countless restaurants, to transit options and nearby cultural venues. Needless to say, those recession-era transplants decided to stay. Now they’re growing up, getting married, and having babies. Downtown is now home to 11,484 residents ages 0-14 — a 53 percent increase in an eight-year span. 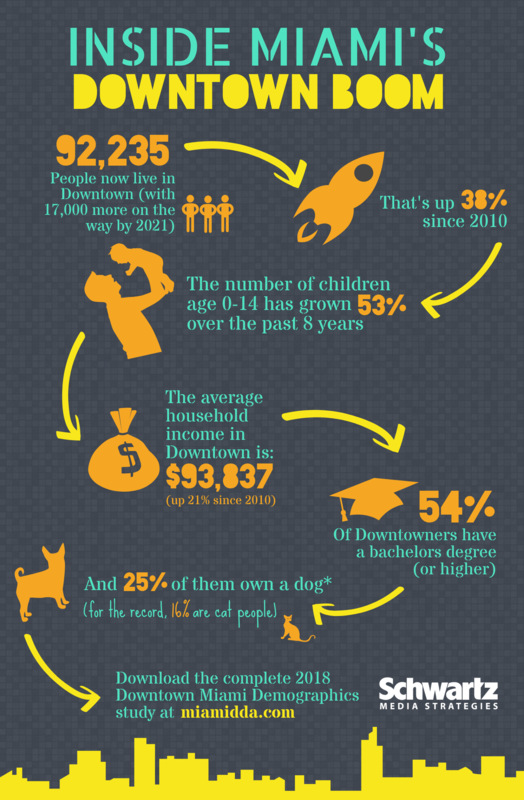 The number of families living in downtown has skyrocketed by 42 percent in that same span. Downtown’s family-friendly evolution hasn’t happened by accident, according to The Miami Downtown Development Authority’s deputy director, Christina Crespi. What else do the Demographic numbers tell us? We’ve created this nifty infographic to spell out the highlights, and you can download the full report if you want to take a deeper dive.